Between the spiders and the cobwebs that my house naturally has in each corner and the piles of leaves that end up on my driveway I don't have to spend ages decorating the house as it's already done! Plus who doesn't love a day where you're expected to eat sweets? Top Ender wanted to be a creepy doll this Halloween, which was fine by me, especially as she was using a costume from the dressing up box. I'm not really freaked out by spooky dolls, although saying that Top Ender kept doing this sort of dead eye glazed over expression thing that was a little freaky. We did a trial run of her costume for the School disco, where a few people wouldn't make eye contact with her and a few others were like "Err, what's so spooky about a doll?!" Big Boy had gone to the disco as a Zombie Knight, which was fine and also what he went as last year (thank you dressing up box!) but for the actual Halloween night he had a costume in mind that he was REALLY excited about. I guess that's because he didn't have to make the darn thing! I kept putting it off, but in the end I knew that I had to think about how I was going to make the costume and as soon as I did think about it, the whole thing took about twenty minutes to make and I had everything on hand. So what did BB want to be? Well, he wanted to be Nyan Cat! I am so proud of this costume. So we're about to set off for the annual Trunk and Treat party at Church (I'll post pictures of the Car boot later tonight on Instagram and here on the blog tomorrow!) with a creepy doll and a cat that won't stop singing. 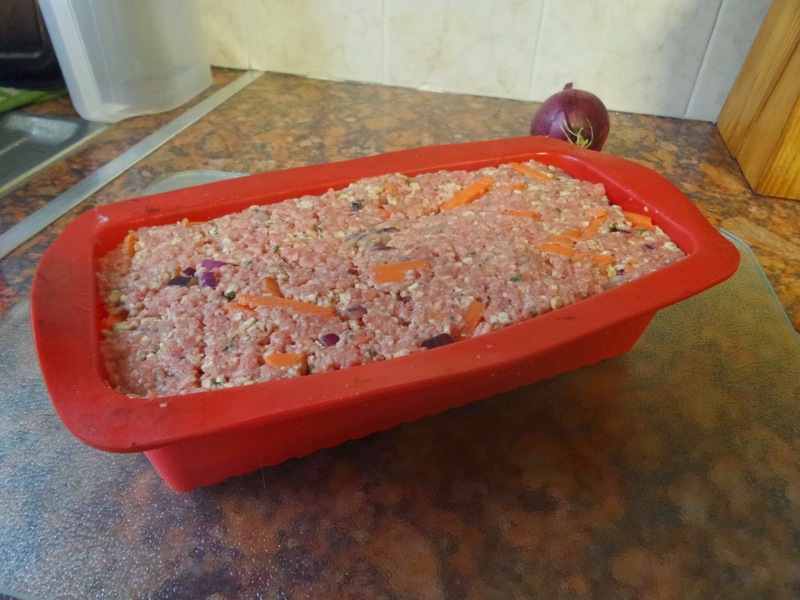 During half term, I made my first microwave meatloaf. 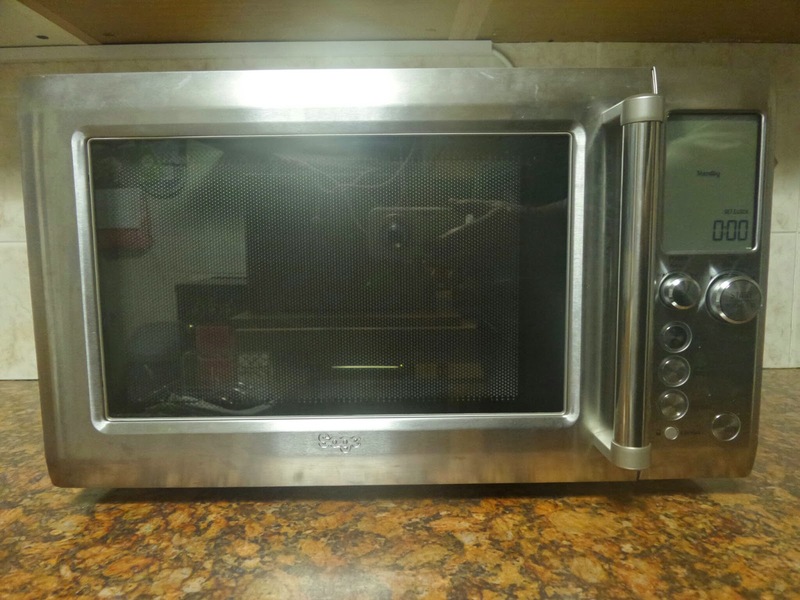 I had explained to Daddy several times what it was that I was doing, but Daddy still didn't understand even as I was about to put the meatloaf in the microwave! 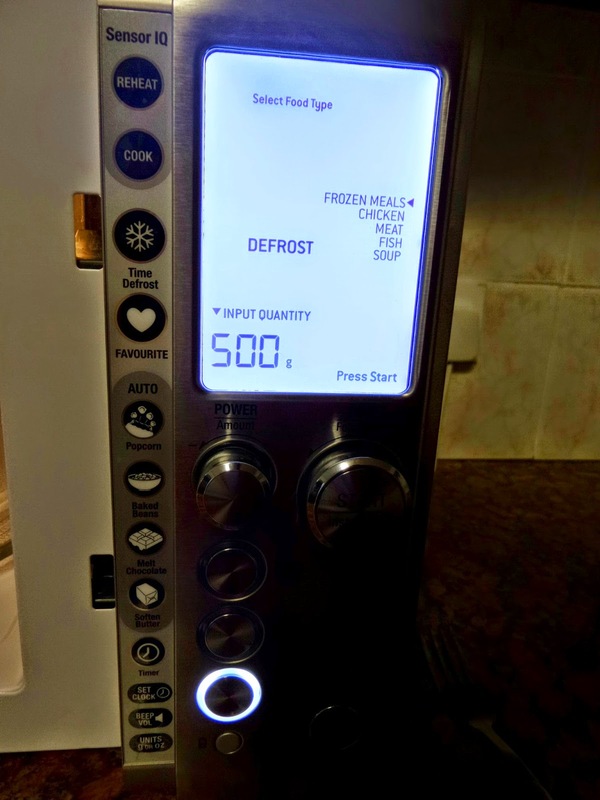 Luckily one more explanation of what I was doing and hoping to achieve and Daddy understood what I was getting at - the Microwave can be used for more than just reheating and can be used for actual cooking and that's why we were having Microwave Meatloaf for our evening meal. 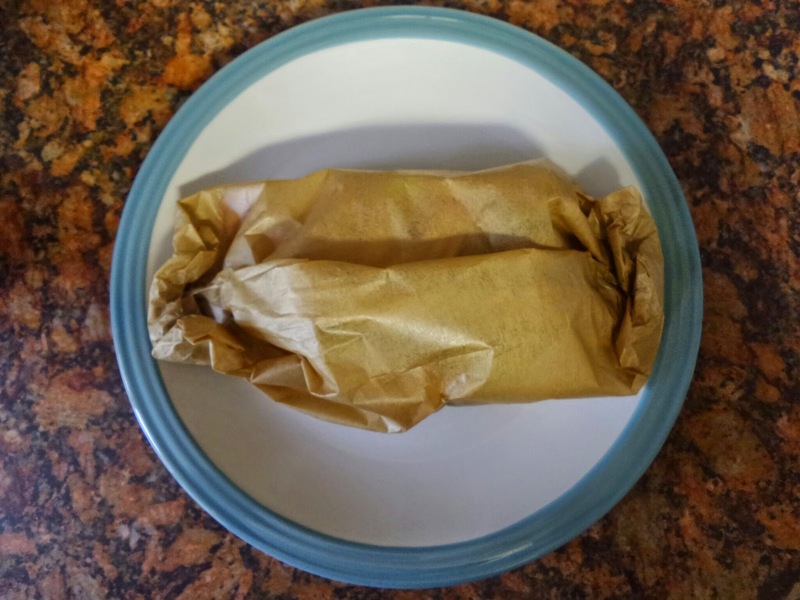 I made the meatloaf around lunchtime, as I was rather excited about it because despite loving meatloaf we haven't had it for a while and when we do have it, it takes AGES to cook in the Microwave and isn't something we can easily rustle up in minutes. 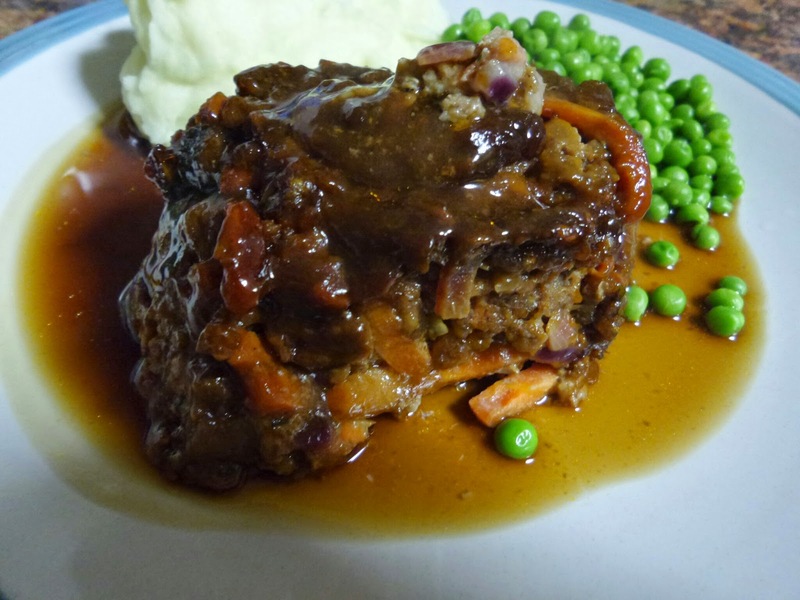 In the end the Meatloaf took 18 minutes to cook, which was just enough time for me to do the dishes, clean up the kitchen and remember that I was supposed to be making Mashed Potatoes, boiling some peas and making up some gravy! The meal was a success, with Big Boy declaring "This meat is the best meat I've ever had!" and Daddy trying to steal the leftovers I'd earmarked for a leftover lunch the next day. 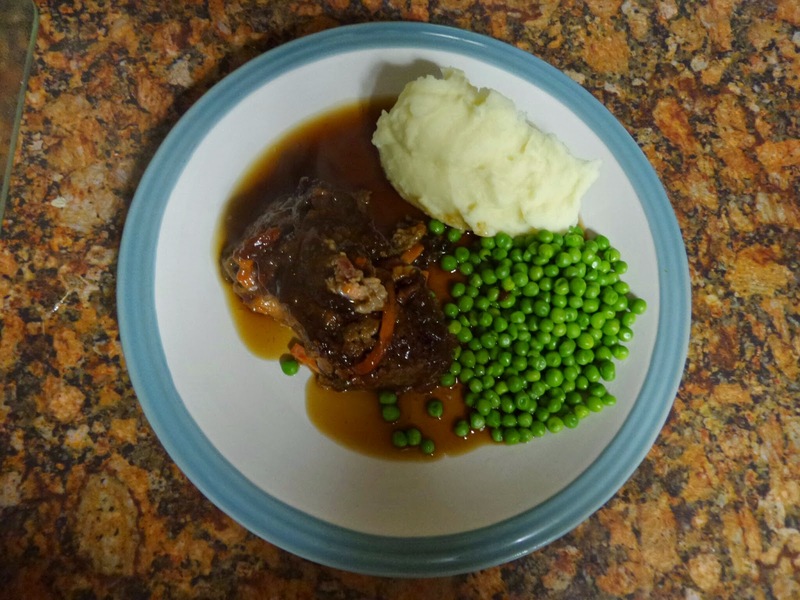 Top Ender, Daddy and I agreed that the meatloaf was moist, flavourful and something that needs to be added into our regular meal rotation because of it's ease to make. 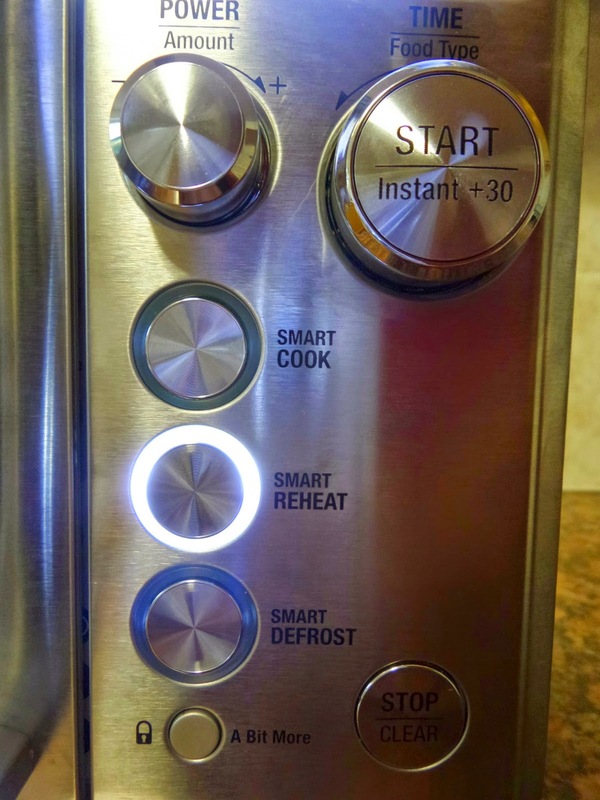 So, here's how to make it! Mix everything apart from the BBQ Sauce, meat and eggs together in a bowl. When everything is nicely combined, add the meat and again give a good mix before adding the beaten egg and combing again. Think how great you're upper arm muscles are going to look after this work out. As you combine the ingredients with the beaten egg, you'll see that the meat mixture will start to stick together, and that's a good thing! Squirt the BBQ Sauce into the base of the silicon loaf tin before adding the meat mixture. As you push the meat mixture in, you might see some of the BBQ Sauce escaping up the side, so try to be gentle, but it's okay if the sauce does start spreading as it isn't going to ruin anything. You can leave the meat to chill, but you don't have to. 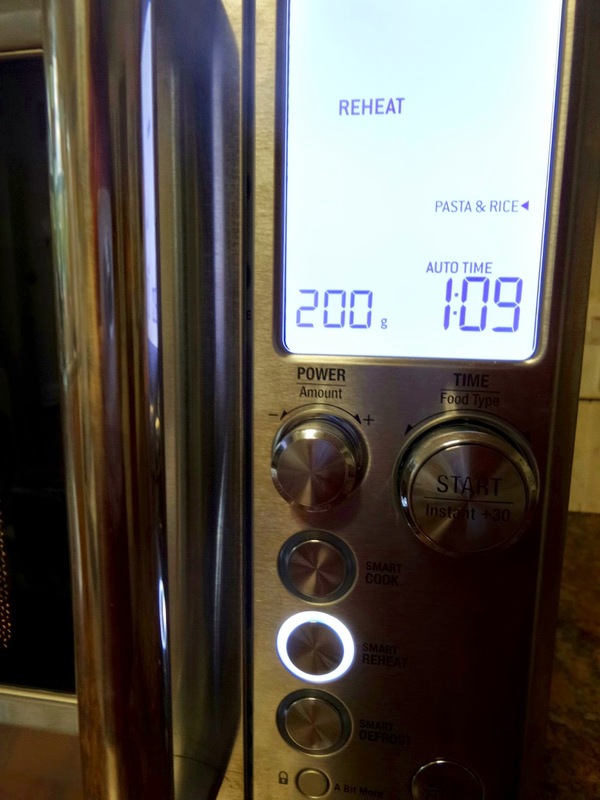 When you're ready, add it to the microwave and cook for 15-20 minutes depending on the level of your Microwave (ours was 18 minutes at 90% power, our microwave is a 1000 watts) and how scared you are of giving undercooked meat to your family. 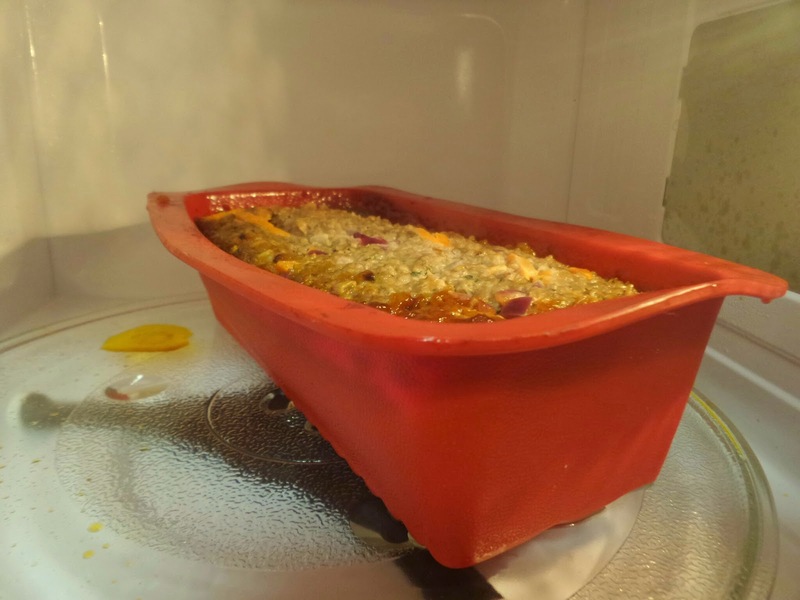 After 15 minutes I cut into the Meatloaf to check how cooked it was, and thought it needed a bit longer, but it could have probably been served to be honest. I'm definitely going to make it again, but without the BBQ sauce (Top Ender thought it too sweet) and possibly with a tomato sauce or even with a little spice to please curry mad Daddy and I'm going to definitely cook it again in the Microwave. 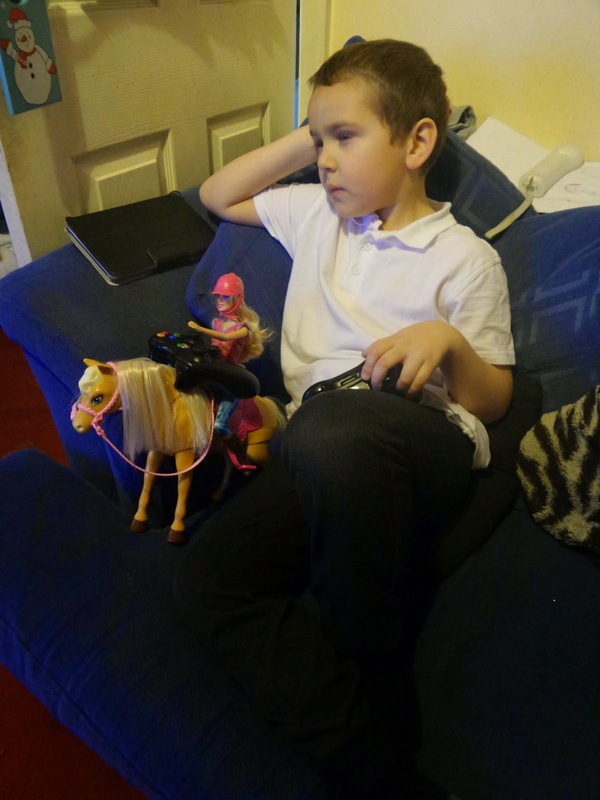 Top Ender has always loved Barbie. I'm sure this is why Big Boy and Daddy (and of course Top Ender and me) can sing every song ever featured in a Barbie film. Luckily for me, now she is ten (almost 11) she can for the most part work the DVD out on her own and has in the past been known to act out the Barbie films with her dolls and it's only right that Big Boy and I help her out... I mean we know all the words and songs for a reason right? When Barbie and her Feed and Cuddle Tawny (who is a horse) arrived, Top Ender and BB were thrilled. Now they could finally stop using my naff old ponies (their words!) and they finally had a horse they loved, because it was able to move and walk and talk... well actually it can't talk but you know it might as well the amount that the children love it! 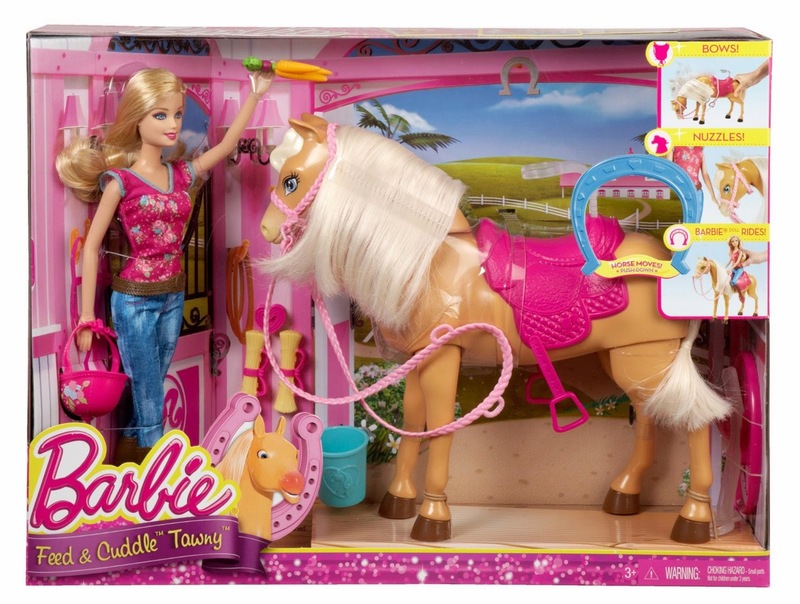 So, what can I as a parent tell you about the Barbie and Tawny Horse set? Well, it's actually quite fun. I've had far too much fun just making Tawny nuzzle me or Barbie. I've been busy making Tawny eat her dinner. I've had the children in stitches laughing at how I can make Tawny move if I ask certain questions. Basically, just like the children have been playing with Barbie and Tawny so am I. The children have been playing with the set a lot too, in fact this is a picture I sneaked of Big Boy playing Minecraft. With Barbie and Tawny. See, Barbie is good for being the second player too. 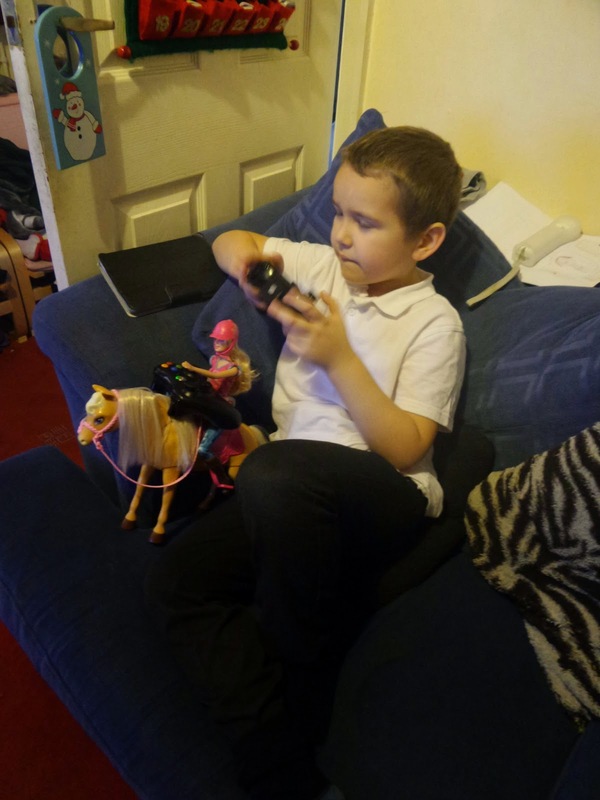 We were given the horse and Barbie to review. We, like most of the UK population, had parents evenings to attend over the last couple of weeks. I always love parents evenings as I tend to have a pretty good idea of what the children are up to within School as I'm one of the lucky parents who gets more than a grunt from the children in reply to my questions about their lessons and what they've been up to in the day and so I spend the time allotted picking the teachers brains about what extra work my children can do to help them improve and to get better grades and that's on top of what we like to call Mummy Home School. I guess I'm one of those horrid Mums that we all promised ourselves we wouldn't be when we grew up, but at least I'm not as strict as a Tiger Mum! 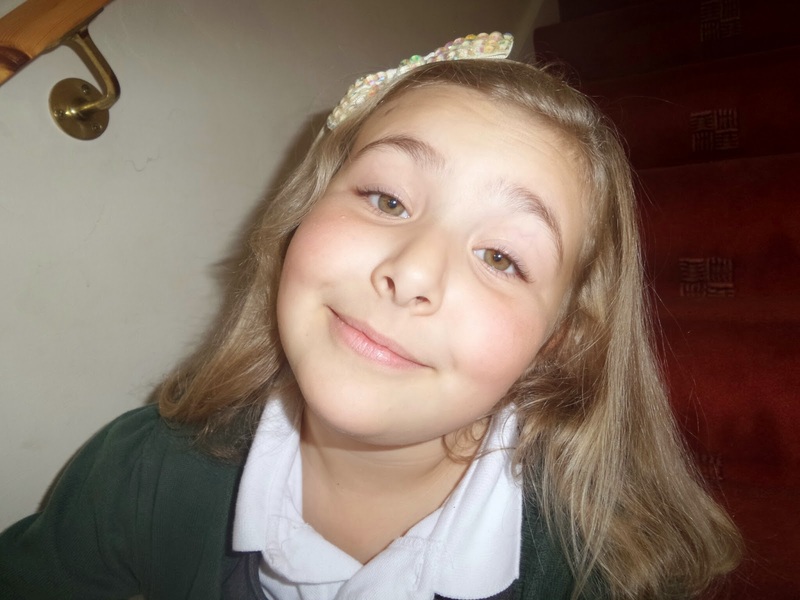 As normal, both my children are doing great with their School work and have a great general knowledge. If I didn't know better, I'd say that the teachers colluded together to give descriptions of the children as being well rounded, having a good general knowledge and being polite, but I know they didn't as I know that I'm actually lucky to have two pretty great kids. 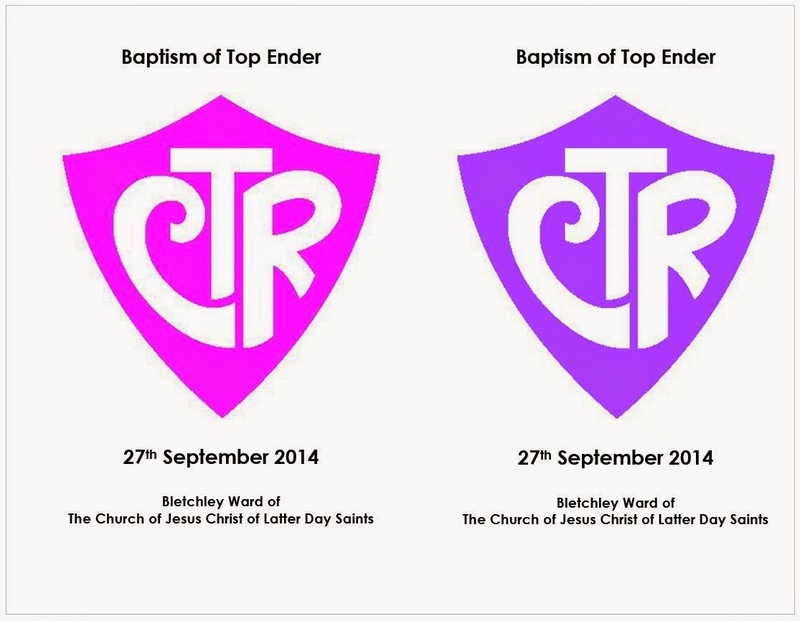 The one thing that Top Ender needs to really work on is presentation. The one thing that Big Boy needs to really work on is confidence in his own skills. And luckily one of the ways that I can help them both with the things they need to work on was sent to me to review. That's right Handwriting Books can solve these problems. 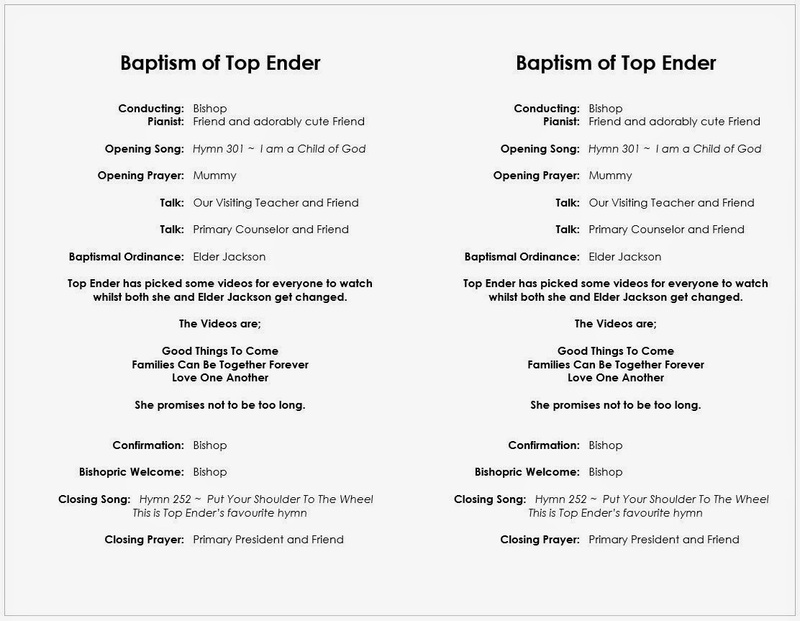 You see, for Top Ender practising her handwriting and remembering the "rules" will allow her to ensure that her work is presented in a nice and neat and easily readable format. By rules, I mean things like a capital letter after a full stop, using commas and hopefully writing in straight lines... and so for Top Ender practising forming letters again and again will help her to take control of what it is she is doing and help her to keep her handwriting a little neater than it is at the moment. It's not a punishment, it's a reminder of the basics. For Big Boy he sometimes feels that he can't do something (I feel like telling him the story about the train you know "I-think-I-can-I-think-I-can") and so for a short time because he was telling the teachers that he couldn't do something they thought he wasn't understanding what he was doing... really what he meant was "I don't think I can do this". Luckily when the teacher and TA worked this out they figured out a way to help him, but BB just needs his confidence increased so that the teacher and TA don't have to sit with him encouraging him to write a little more or add up yet another sum. So with Handwriting Books being simple to understand and follow, there is no excuse. BB can just work away and complete the exercises set and feel that he has accomplished something great! So, the children are working from the two books we were sent and are available to buy on Amazon. As they are laminate pages, they are wipe clean and so the children can complete the exercises again and again and that's how new handwriting books are helping me help my children succeed. We were sent the two books to review. 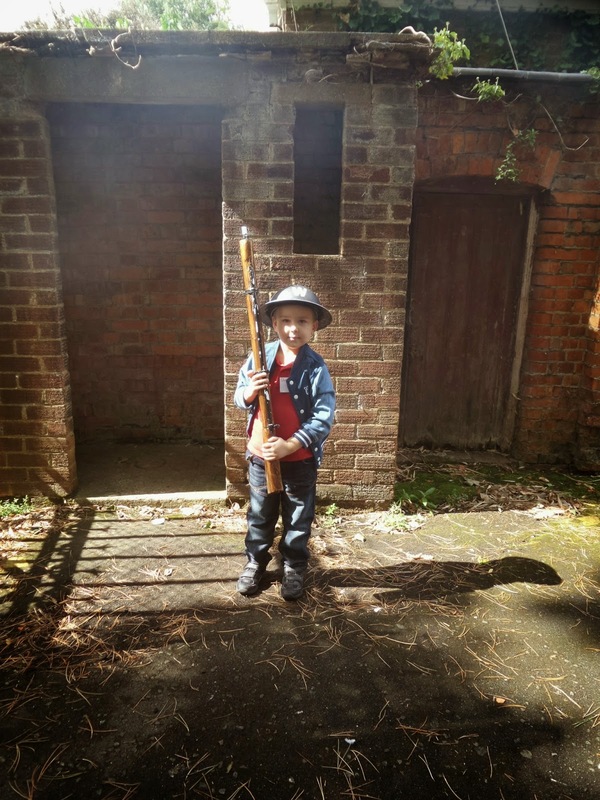 With it being the start of the Half Term holiday for us here at A Mother's Ramblings, I thought it wise to recount back some of the information I learnt at a recent event I went to with the children. Well I say recent, it was during the Summer Holidays, but it's apt for now as if your children are anything like mine then the next week is going to be filled with requests to go on the computer or games consoles and well the event was an eye opener to how safe we all are online. 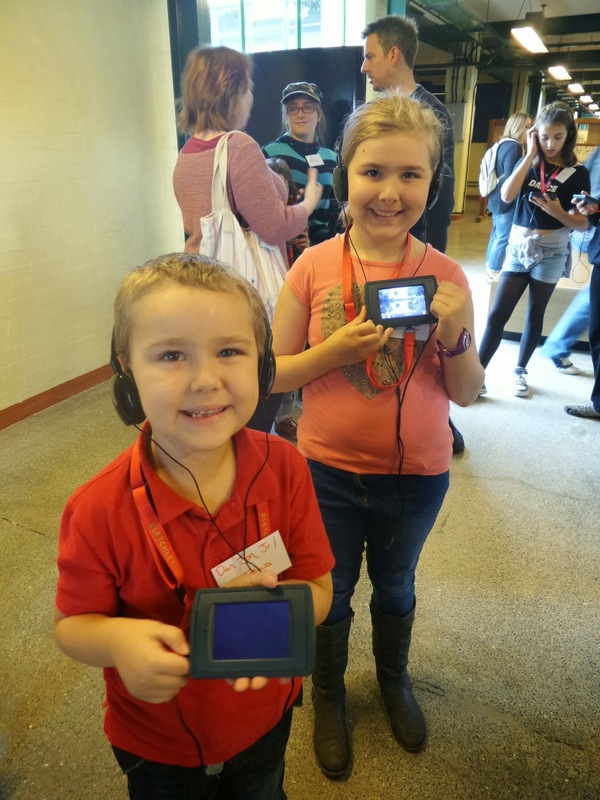 We spent the day at Bletchley Park, which as you may know is where the Government Code and Cypher School studied and devised methods to enable the Allied forces to decipher the military codes and ciphers that secured German, Japanese, and other Axis nation’s communications. Remember that film Enigma? It's just like that, but with less Kate Winslet and more local people not having a clue what went on there and treating the people that worked there quite badly because they didn't realise they were actually doing some pretty important work. We toured the entire site, which was great because despite living quite close to the park I've only ever been for the Firework displays and a few self tours and so I didn't know that there was an unexploded bomb in the courtyard. 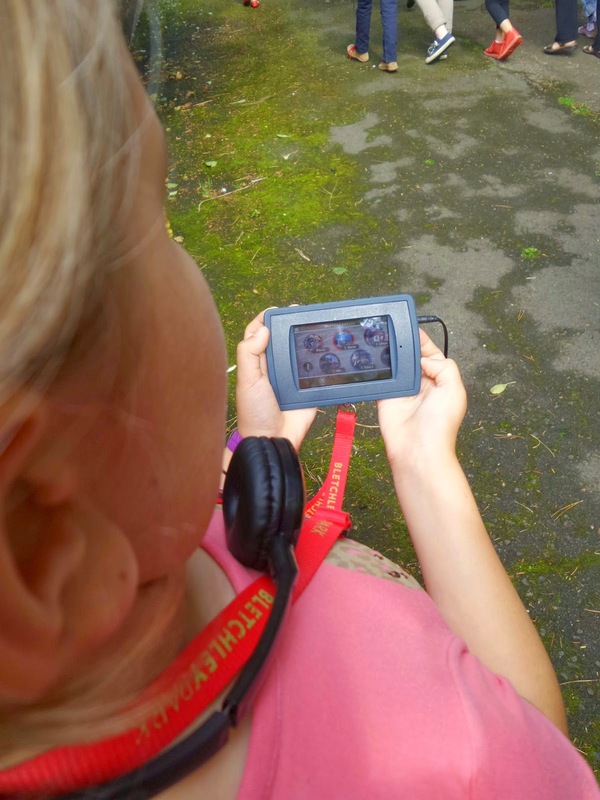 The great thing for Top Ender was that she could have her own tour of the park using the iPod Touch Multimedia guide. We had a good play in the McAfee Cyber Security Exhibition, which highlighted a lot of bad habits I've picked up... 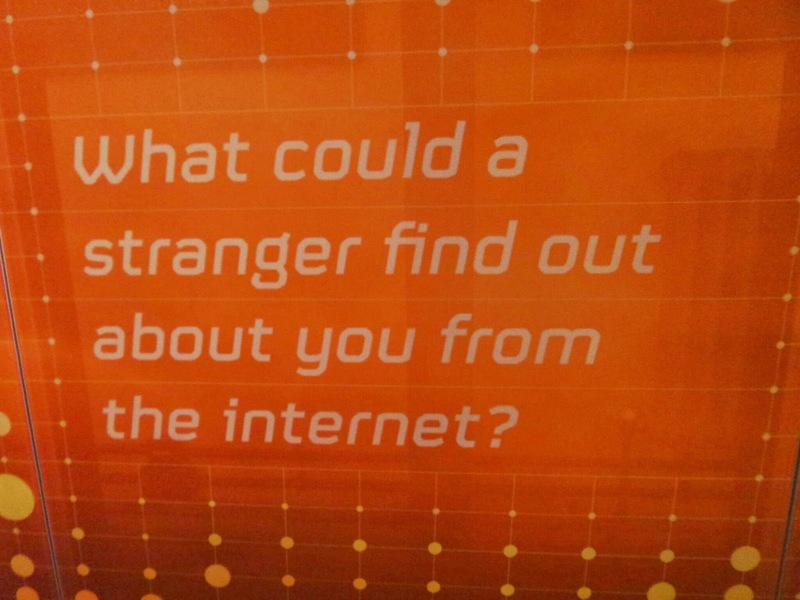 I mean I bet most of you could name my sister, my maiden name and the name of my pets, which tend to be the sorts of things that people use as passwords right? Actually I don't and I bet you don't either, but you know the idea I'm getting at and the answer to the question posed in the photograph below is quite scary when you think about it. The end of the day saw all the bloggers and children take part in a Safety Workshop and compete to see who could name the most online apps and online logo things, Merry (of Patch of Puddles and Merrily Me fame) and I kinda misunderstood and spent ages doing one sheet but were surprised at how many we did and didn't know. Honestly, there are more dating apps and scary apps for scary people that may want to *see* more of other people than I realised! I live such a sheltered life, but it can't be that sheltered as I did manage to guess most of them correctly... I blame my single friends. The worry thing was that Top Ender, at only aged 10 had a pretty good knowledge of what all the apps were. Most of them were normal good girl apps, such as Blogger, Youtube, Instagram, Pinterest, Twitter, Skype, Tumblr and the like. 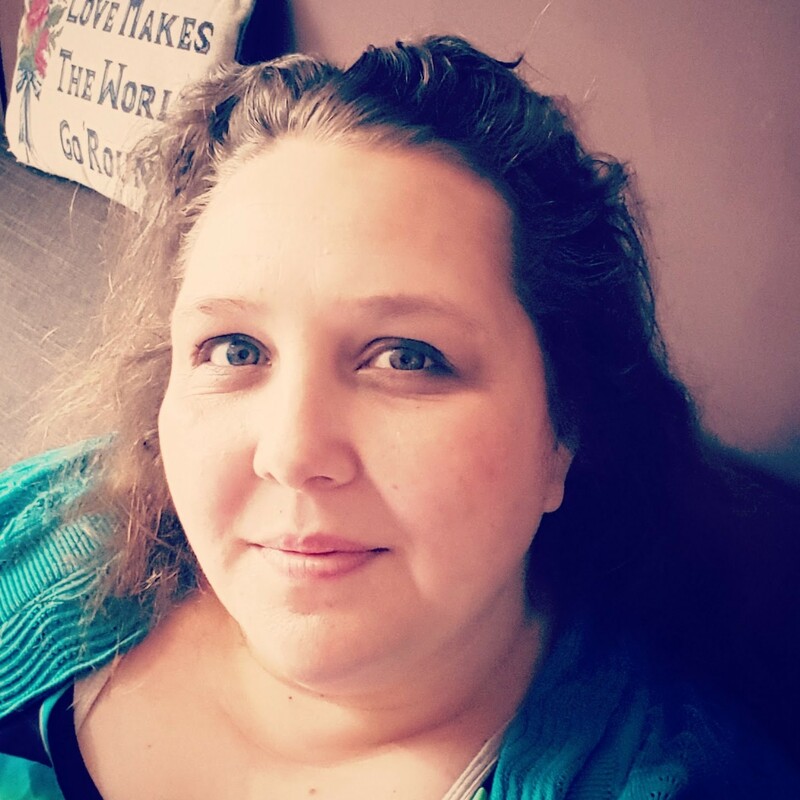 You know the sort of websites and apps that she has on her tablet and phone and sees me use and so of course uses herself, but she surprised me knowing a few more that I didn't recognise. I guess however, that it shouldn't have come as a surprise that she came first in the Children for naming apps and I came first in the Adults... me thinks we might spend a little too much time online! I know that online safety is taught at School, and I know that Daddy is forever telling the children about how to stay safe online too and ensures that our virus scans are done and up to date and he takes care of all the back ups and the like BUT after we had finished for the day and were on our way home the children and I chatted about our online safety and we realised that what we'd been learning the whole day was really important and serious. Speak to your children regularly about the sites that they are using and keep an eye on security settings so you can make a judgement on whether the sites they are viewing are suitable. Research from McAfee and the Anti-Bullying Alliance found that over half of 14-15 year olds are hiding their online activity from their parents, with over a fifth actively deleting their browsing history. If the communication channels are open with your child, they are more likely to speak to you if things may be bothering them. As soon as your children start using the internet make sure that they understand about how to stay safe online – don’t accept friendship requests from people you don’t know, verify requests if they look to be coming from someone you do know, never agree to a private chat with a stranger and never post your mobile phone number or home address online for all to see. It’s vital that your child understands the value of having secure passwords to any social media accounts that they may have set up. If they learn this discipline early, it will set them up for life! For example, never share your password with anyone (even their friends) and make sure it is something memorable to you, but not something someone could guess easily. Furthermore, encourage your children to change their passwords regularly to keep their accounts safe. Try and be open and approachable, that way your children will come to you if they have a problem. talk to your kids about how they use their computers and smartphones and ask about any concerns they might have. Be prepared to field any questions they may ask – there are plenty of online resources available to help support you in answering tough and delicate questions. Don’t suffer in silence. Research from McAfee and the Anti-Bullying Alliance found that 34 per cent of 14-15 year olds had witnessed cruel behaviour online. If there is anything worrying your child, take measures to block these offenders from their accounts and report them if necessary. Furthermore, it is valuable to save the evidence; your instinct may be to encourage your child to delete upsetting comments, however make sure you save screenshots so you are able to report the culprit if this is necessary. 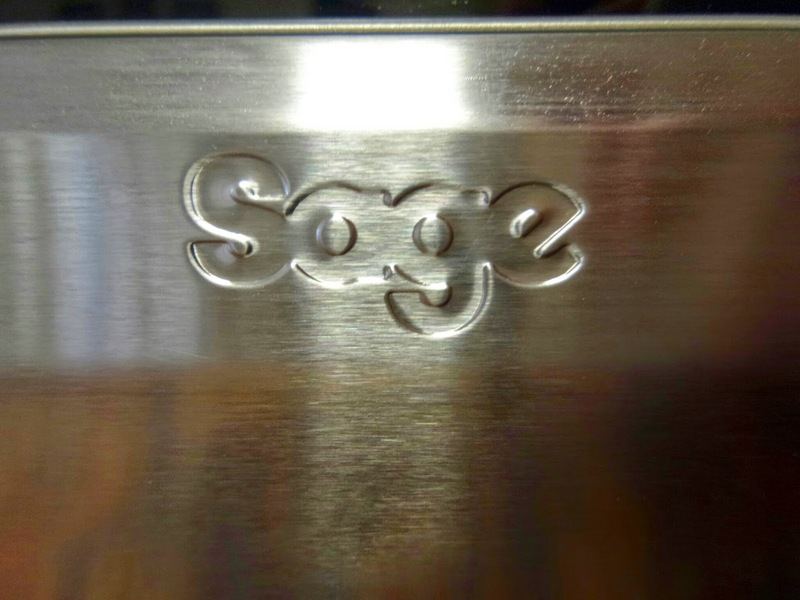 Do you have anything else to add about keeping safe online? When Big Boy's Beaver troop was asked if they'd like to go on an overnight camp, sleeping in a local Museum, Big Boy was excited. So excited that he forgot our pact to never ever go camping and immediately it was all he could talk about. It was also agreed, that to make things easier on the leaders at the camp it would be much more sensible for Daddy or I to go as a helper to BB's troop as we could take care of BB's medical needs. Without the drawing of straws or the flipping of a coin I volunteered to go because having a DBS check (thanks to being a governor) kinda proved that I'm safe around children. 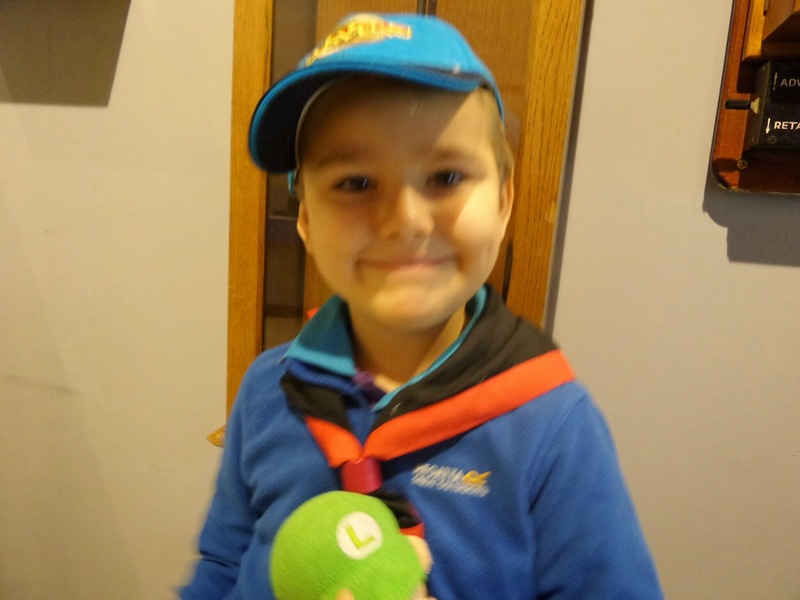 Despite hating camping, I thought of myself as being really lucky, because I'm sure that every parent of a Beaver has wondered just what happens on camp and I was going to be able to experience it! When we got to camp the boys from the troop decided where we were going to sleep and luckily for us they decided that we should sleep in the Computer Room, rather than in the Cobbled Street. 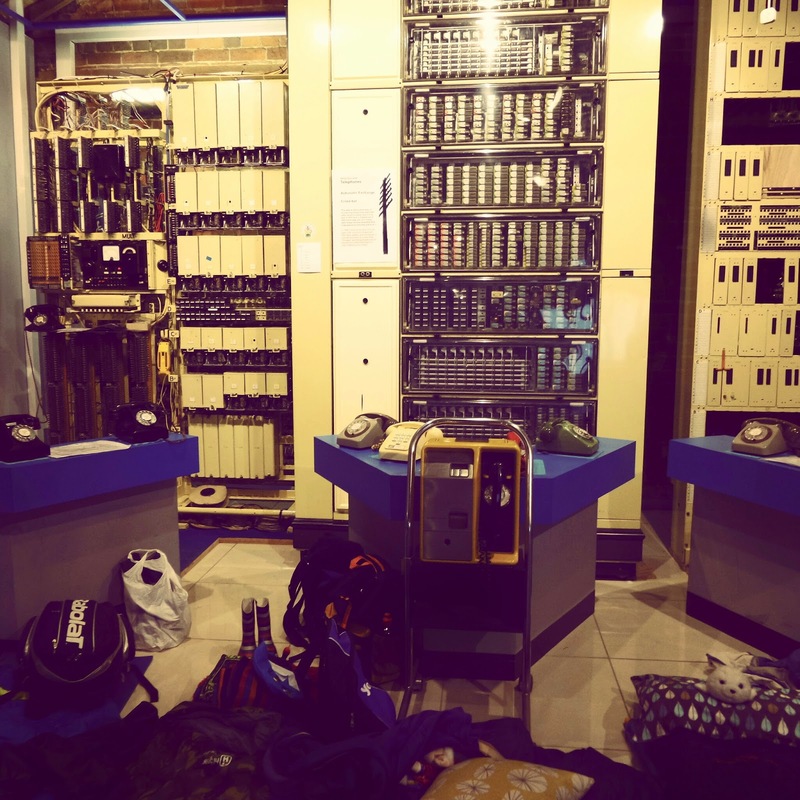 So our bed for the night was in front of a bank of telephone exchanges. 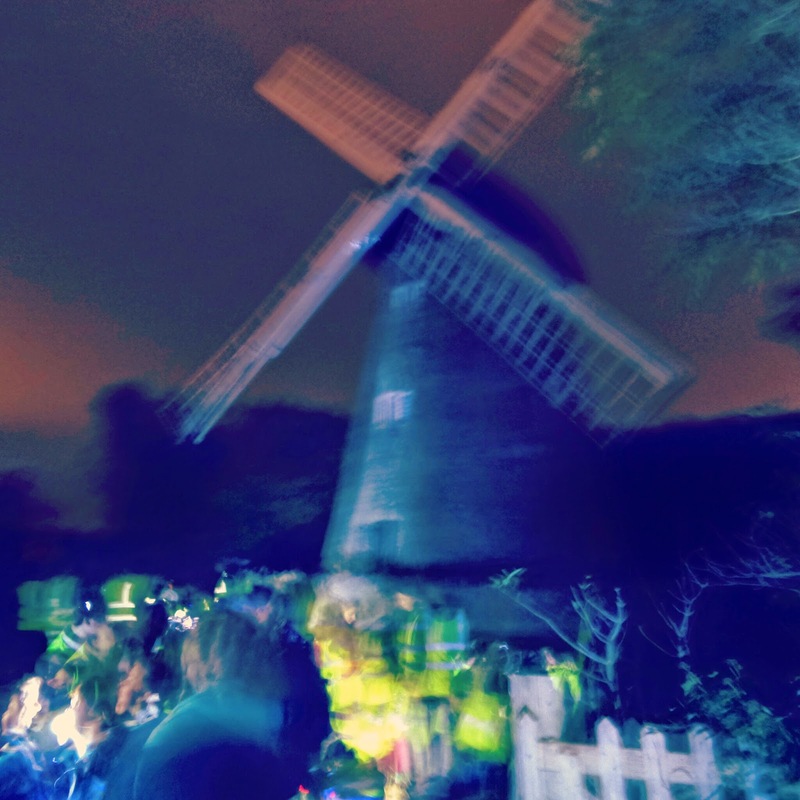 We went for a night hike, to a local Windmill and I have to admit it was rather fun walking with all the Beavers and Leaders in the dark and using our torches to light the way. When we got back, after a quick round of soup and bread rolls we all sat down to watch a film. Or rather those of the Beavers who weren't already falling asleep, like BB watched a film (Night at the Museum by the way). 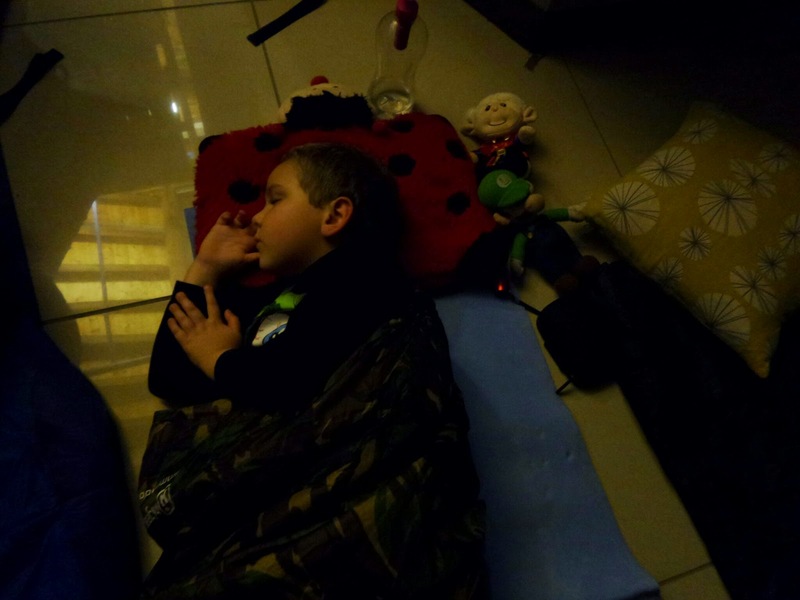 I agreed with the leader, that as the other two boys in the troop were still awake and enjoying the film, I'd take BB back to our sleeping area and she'd watch the film with them. BB got ready for bed and was asleep in seconds. When the boys and the leader came back, they too got ready for bed and soon they were fast asleep. Every two hours I woke up to test BB's blood sugars (he was high because of the excitement) and check on the other boys. BB woke up at 6am, and lay in his camp bed until 7am, when the troop leader woke up the other boys and everyone got ready for breakfast. 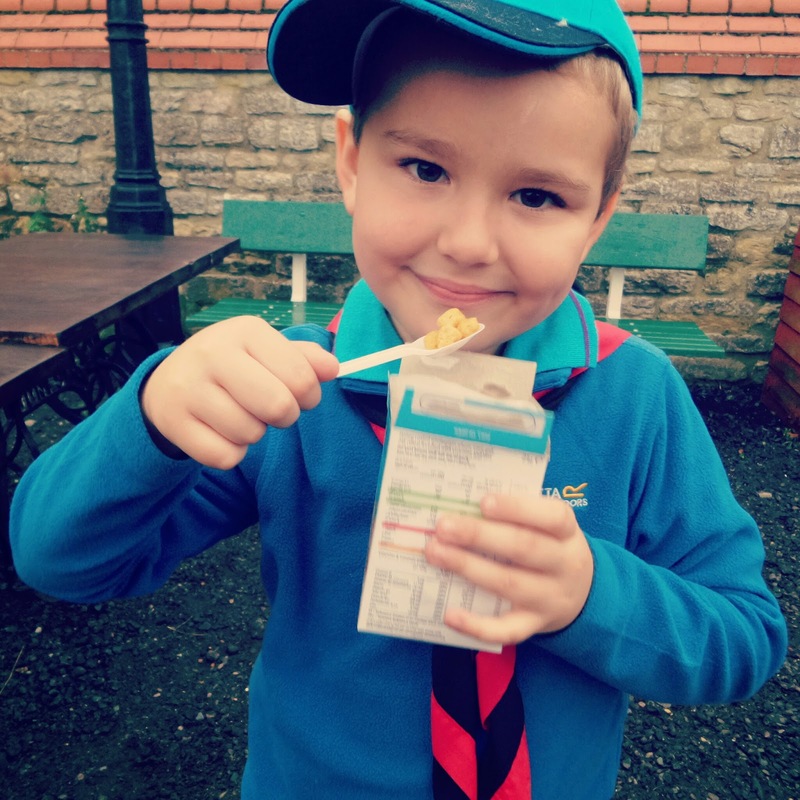 Big Boy loved the first breakfast, (Yes, first breakfast, he had two) of Cereal and despite never eating the stuff at home, was soon tucking into a packet. I'm sure that it was something to do with having the milk in the box that made it so appealing. After a second breakfast of Bacon and Sausage Butties, (my first breakfast!) we spent the morning carrying out various challenges such as writing our names in morse code, transmitting messages in Morse code, translating morse code messages, making phone calls, sending emails and a lot of other challenges before lunch (Burgers and Hot Dogs). After lunch we did a finished a few more challenges and the hour or so before parents were due to pick up their children was filled with camp fire songs (complete with dodgy actions), various games and looking round at the leaders and children I could see the appeal of camping. I could even see the appeal of being a leader in Beavers. Of course getting home and being in my own bed was even better than camp in my opinion, but Big Boy seems to think Camp was the best and is already counting down the days until Christmas Camp. I guess I'm going to that too. If you saw my blog post about Keema, then you'll know it's basically an indian mince. 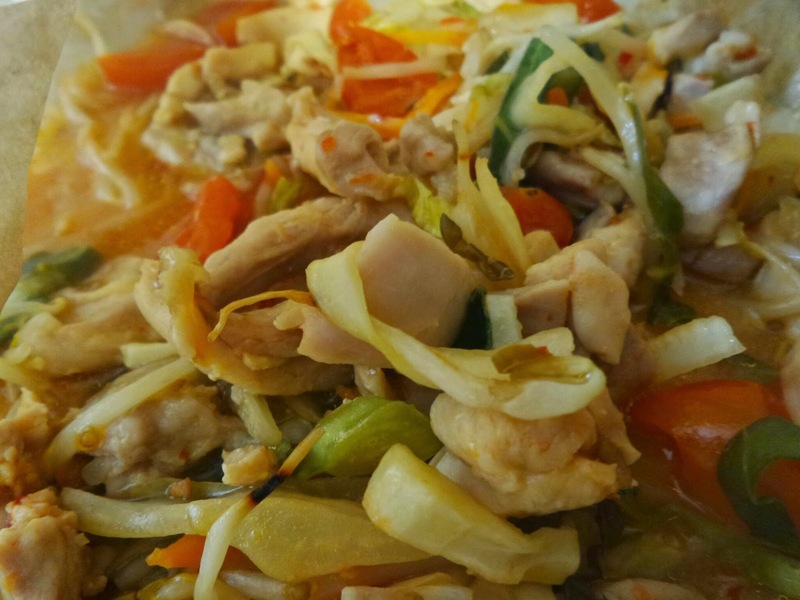 It has various spices in, that make it tasty but not too spicy (well depending on how many chillies you put in!) 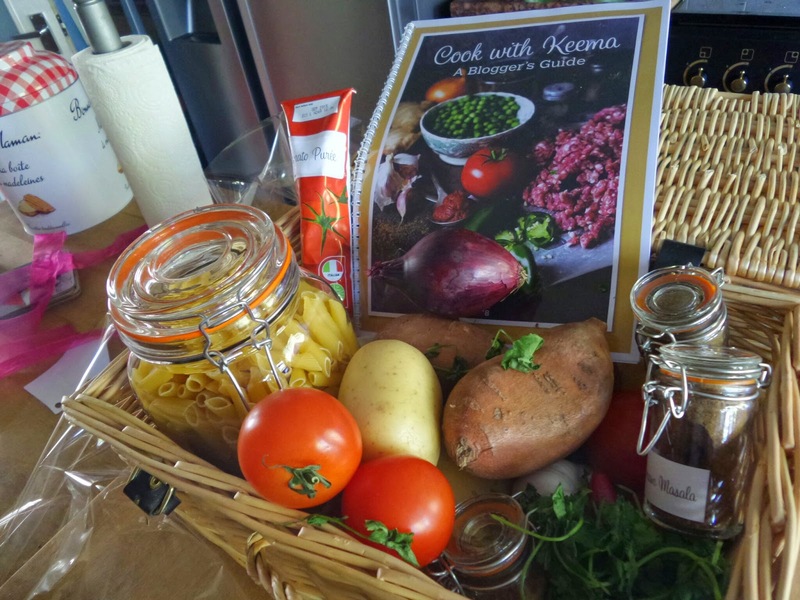 and the good news is that when you use the Keema as a base for dishes that use mince as a basic ingredient, such as Spaghetti Bolognese or Shepherd's Pie it adds a new twist to family favourites. 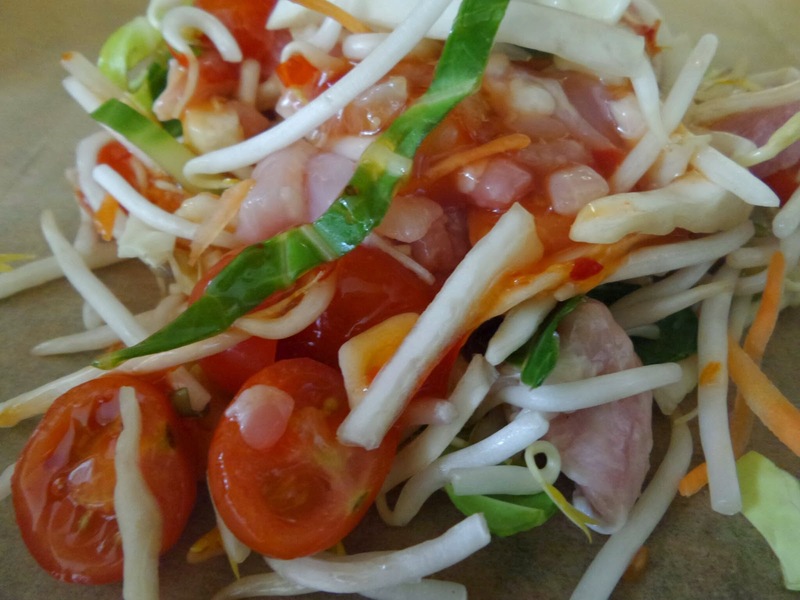 I spoke to Daddy and we thought about what we could turn the Keema into that we would enjoy, that our children would enjoy and what would be something worthy of winning the competition too (nudge nudge, go vote for me!). We thought about what it was that was in the Keema, and it was when I said that there was cumin, we knew what we had to make it, what we were going to turn it in to. Baked Sloppy Joes! 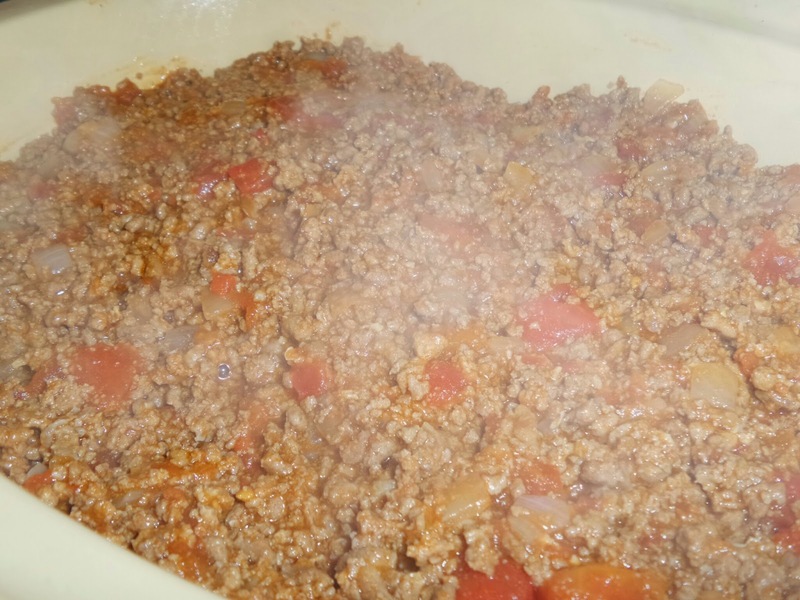 We really love Sloppy Joes, and one of the spices in the recipe we make is Cumin, so we thought it would mix well. Daddy decided to make the dinner, mainly because he loves making Baked Sloppy Joes. We added more tomatoes to the Keema, and we didn't add in all the chillies as the children wouldn't eat it if they were all in there (they are seriously bad with the chillies!). Whilst we were at it we also added a little more onion, because who doesn't love onion and mince together? 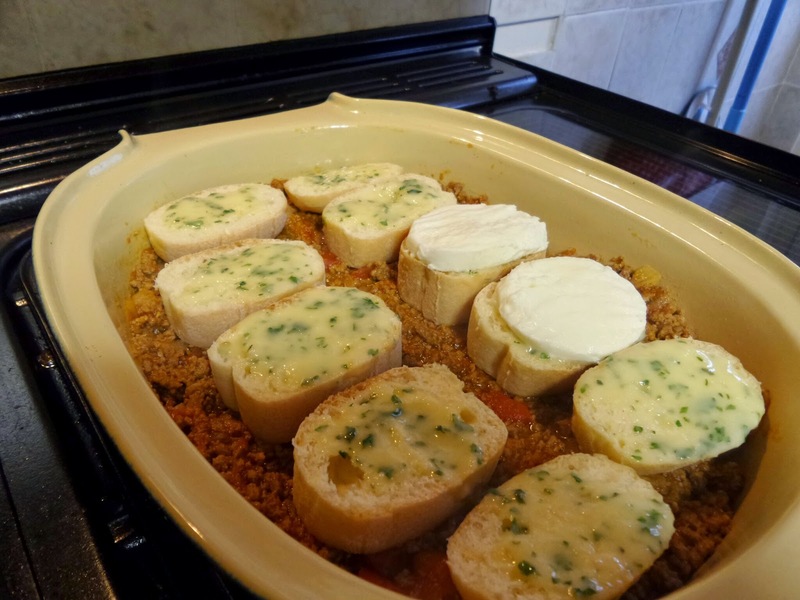 We put it in a dish, and added slices of gluten free bread rolls on top, which we had spread Garlic Butter on (home made!) 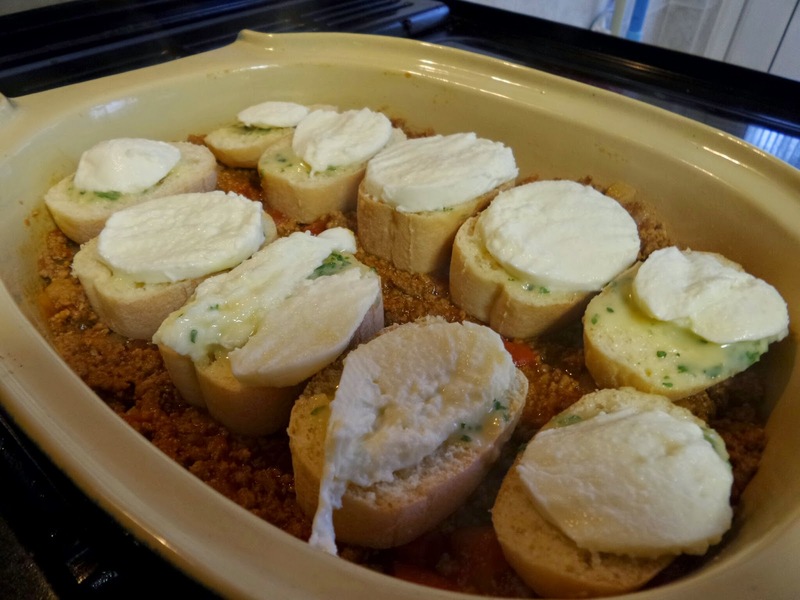 and then added slices of Mozzarella to the top of the slices of bread rolls and basically that was it before we threw it into the oven. As soon as the meal was cooked (around fifteen minutes as the Keema was already cooked) we served it. 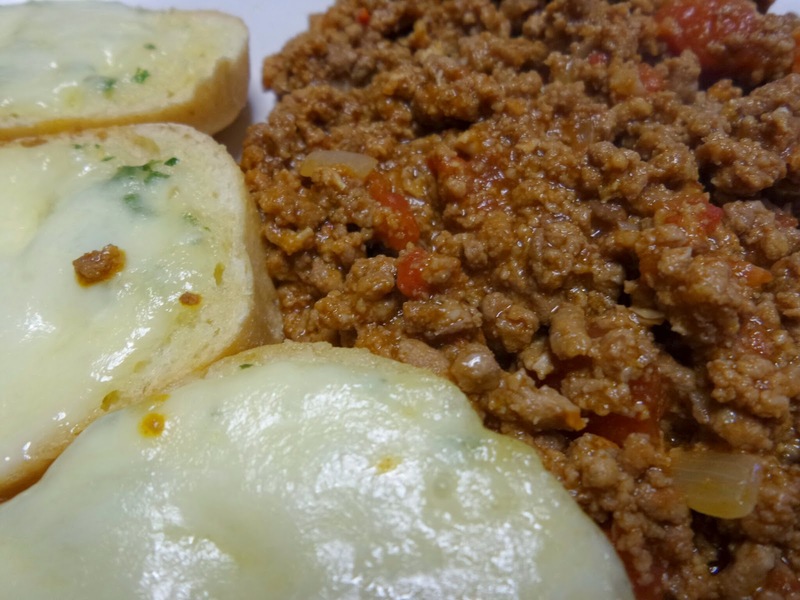 The Children didn't realise that there was anything different in the sloppy joes, but Daddy and I could tell that there was and really enjoyed this slightly spicier version of what is becoming a classic in our home. This version of the Baked Sloppy Joes is going to be in regular rotation in our house. What would you make with the Keema if you were making dinner for your family? We were sent the ingredients for Keema, and added our own extras to give it our own special touch. 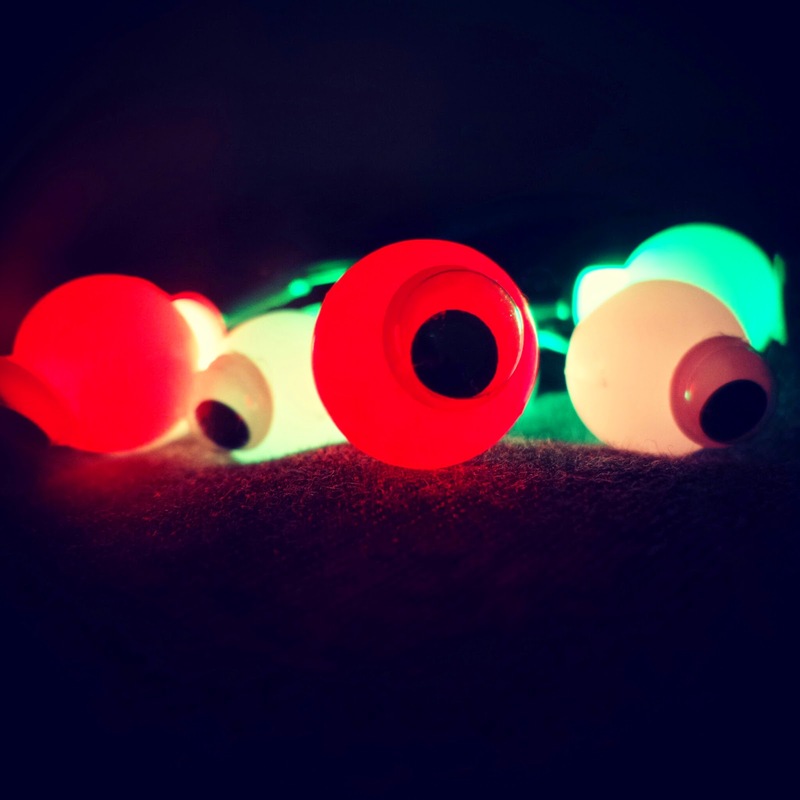 When the box of craft items arrived from Craft Merrily and Bostik I was super excited, surely this would be the month that I looked in the box and someone had handily written a sneaky note giving the children and I some ideas of things to make with the brilliant craft items. I eagerly opened the box and found out that, no. They hadn't. 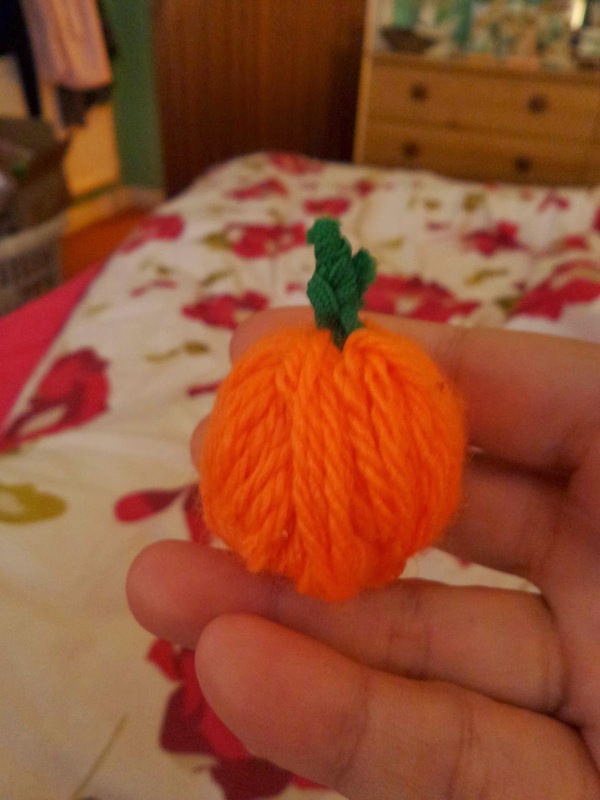 It was quite late when I opened the box, the children were in bed and as I sat on my bed looking through the items and hoping for some inspiration when I started fiddling with a piece of wool whilst watching TV and ended up somehow without thinking about it, creating a pumpkin! I was so proud of myself. I had no idea how I made it, but working "backwards" I figured out that I had been sort of making a pom pom and had been wrapping the wool round a wedge of cardboard. I'd then used a little part of a pipe cleaner to fix the bottom together and a little binding to fix the top together and create a stalk. I'm going to let my hands do more crafting without engaging my brain in the future. 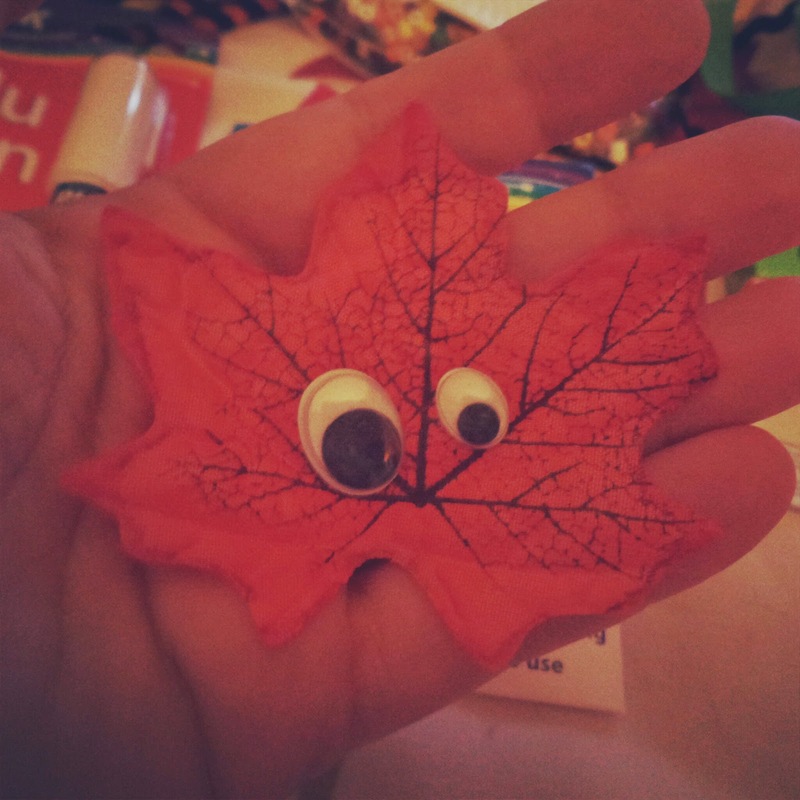 The other thing that I managed to do was create a little monster leaf, by sticking eyes to a leaf, using the glue pen. 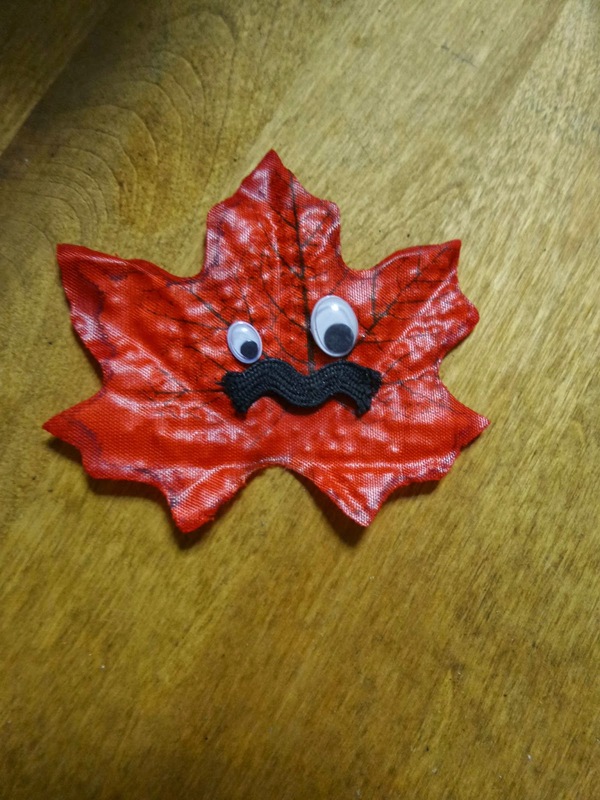 This craft took on new meaning the next day when a few other bloggers decided to borrow my idea and they created monster leaves with their children. 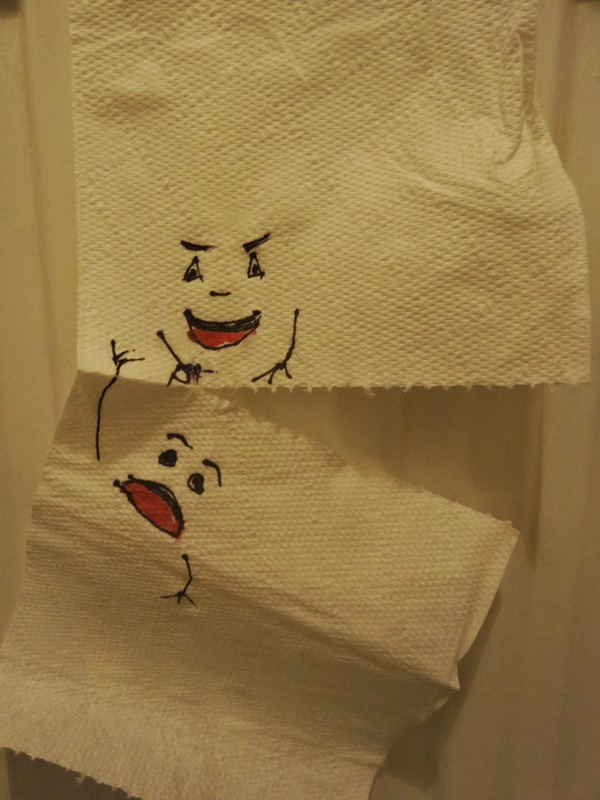 I'm so pleased that my little joke to brighten up the children's lunch, caused inspiration in others. I feel like my work is done. 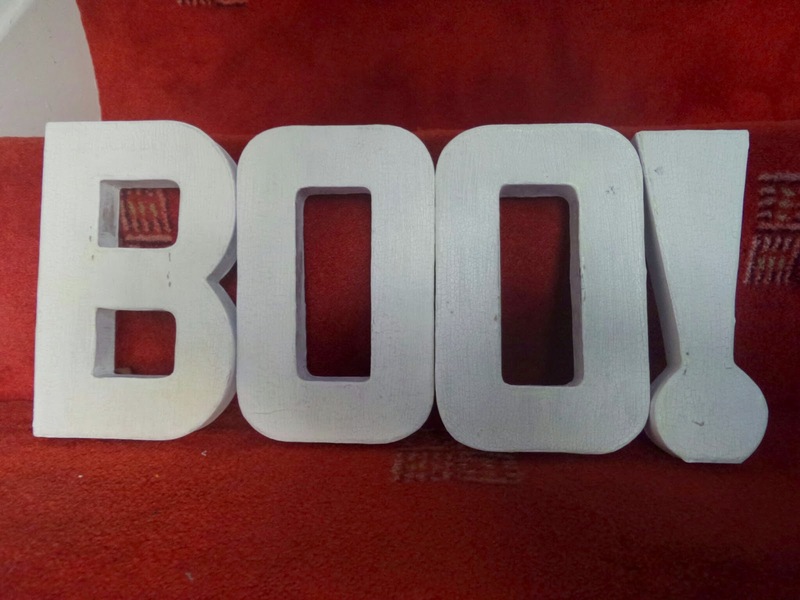 They are being turned into something rather spooky for Halloween, so watch this space! 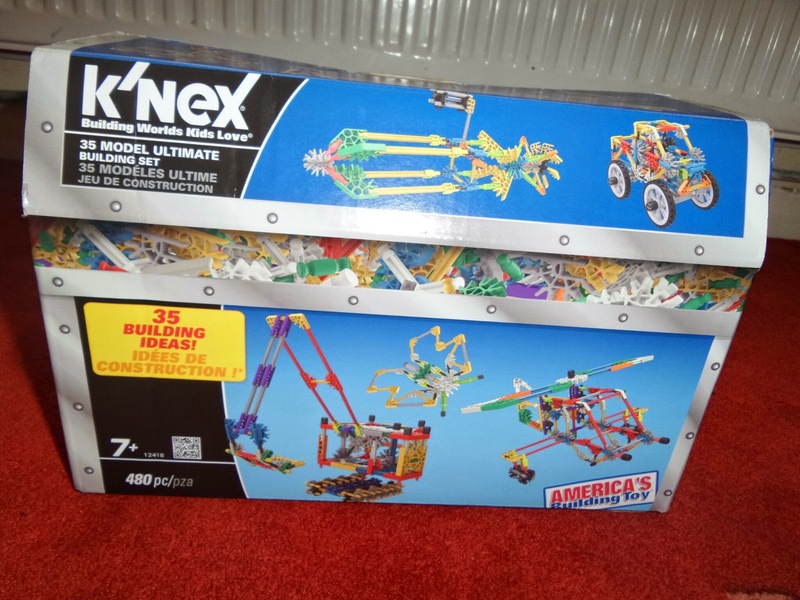 I never had any K'NEX as a child, I remember one of my cousins did as I played with it one rainy afternoon when there was a family party happening downstairs and us children had got rather bored. I think I had high aspirations of building a working Ferris Wheel like on the box, but I think in the end all I ended up doing was making some random works of art. When K'NEX asked if we'd like a box to have a go at trying to be one of their ultimate K’NEXPERT builders I said yes, hoping that the children would be inspired, instead they looked at me as if I'd gone crazy! Of course as I explained what it was that they were supposed to do they looked a little more interested, but the box was left alone for most of the Summer. Big Boy was seen however, emptying it out on the floor and placing things in size order, one rainy afternoon! 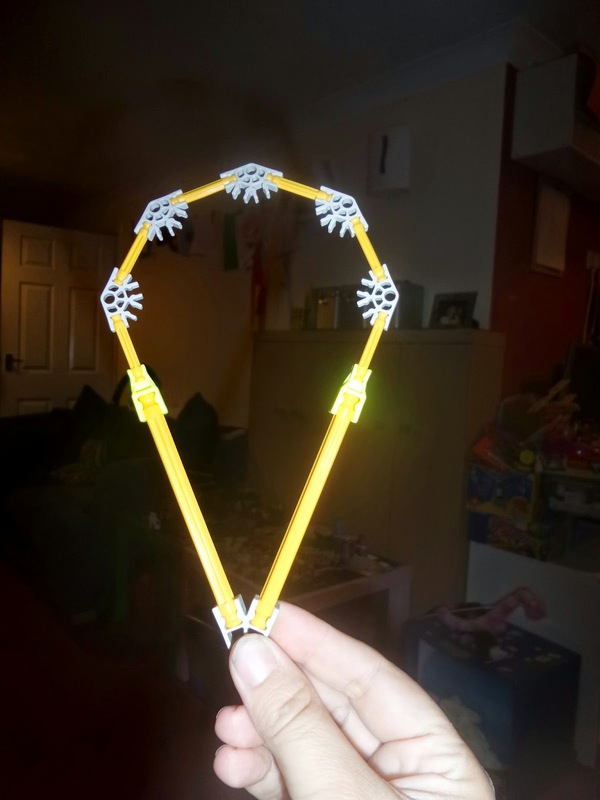 So it seems that for us as much as we love the idea of K'NEX, that the reality is unless Mummy or Daddy plays with it, it's going to go unplayed with. At least that's what we thought until I opened up the box last night to have a play myself and found this Ice Cream inside! It seems, that either Top Ender or Big Boy (my money is on Big Boy) did have a go! If you or your family think that you could be the next ultimate K’NEXPERT builder, then enter the competition which will be judged by a panel of experts including David Church of Royal British Legion Industries, with 15 years K’NEX building experience including the construction of a life-sized Monster Truck, and Joe Smith, Chief Development Officer at K’NEX. The judging panel will be looking for originality and creativity when searching for their winners. 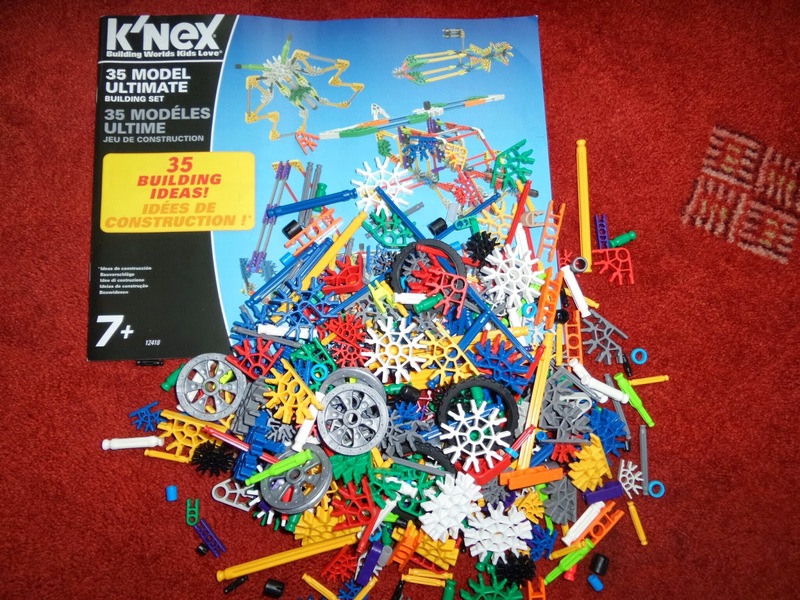 The hunt for the ultimate K’NEXPERT builders in the UK is open until October 31st 2014, so you haven't long to submit a photo of your construction, plus up to 200 words on how they came up with the idea and how many K’NEX pieces were used. Full entry information and terms and conditions can be found at www.knex.co.uk. 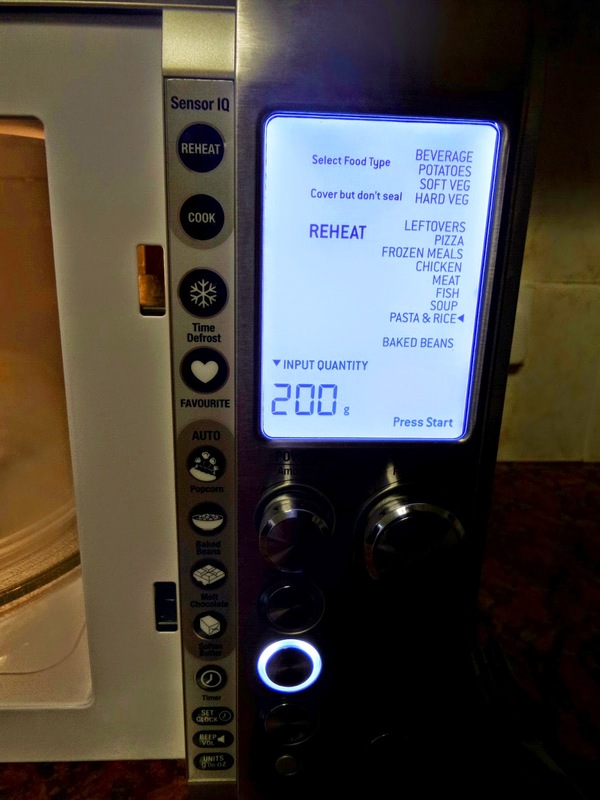 After my review post about the One Touch Microwave by Sage, I was after suggestions of meals that would feed the family and that used the Microwave as more than just a tool for reheating the food. 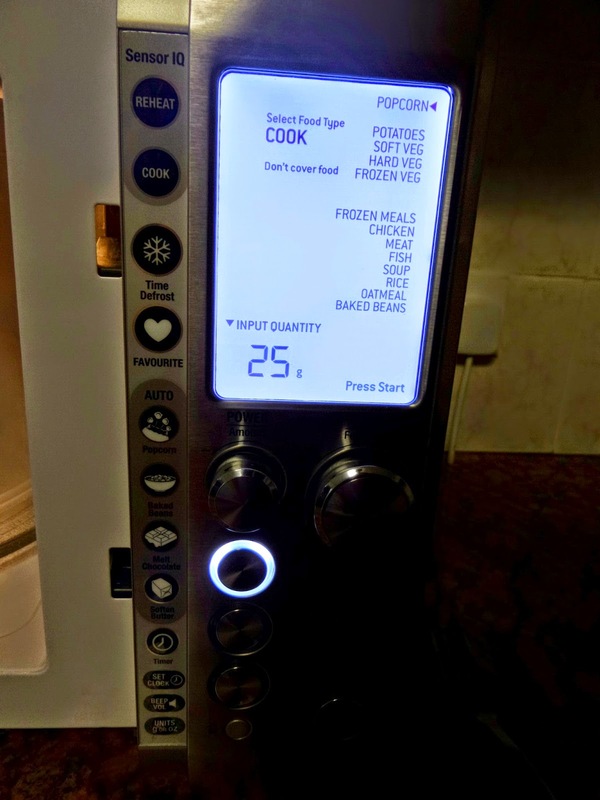 Basically I wanted to be the sort of person who would be able to rustle up a brilliant meal in minutes and have people be amazed that I did it by using the Microwave. 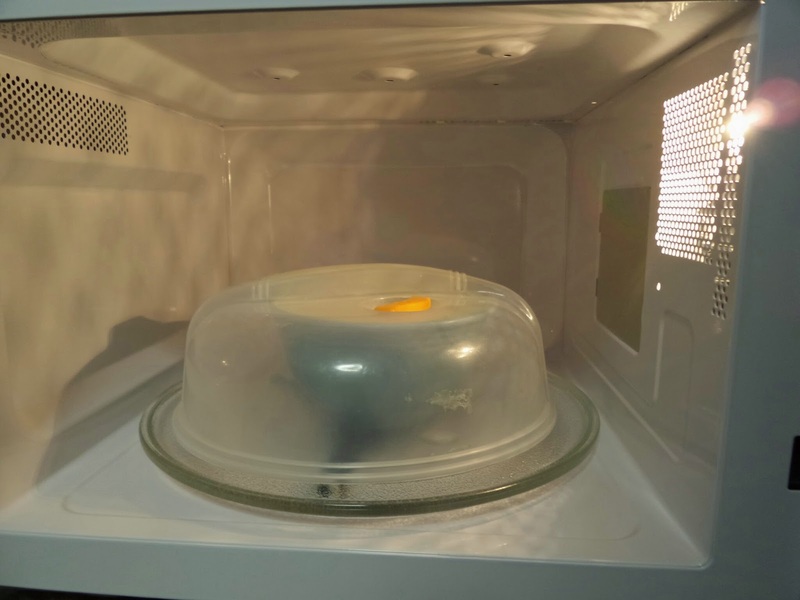 I called my sister up, she too uses her Microwave as something to quickly heat up leftovers, or to make quick things in so we got to work thinking up some ideas of some meals that we could cook using the Microwave, other than the Chicken and Vegetables I made. My plan is that each week, I'll make one of the dishes and report back if it's been a success or not and give a basic recipe too. If you have any other ideas, let me know and I'll add them to the list! 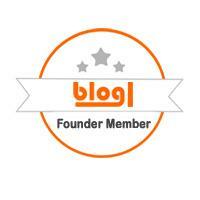 Everyone who knows Top Ender knows one basic fact about her, when she grows up she wants to be a Fashion Designer. It's all over her blog, it's the only thing she chats about when talking about future careers, when looking at the local Schools that she could attend over the last few weeks, it's been one of the deciding factors (do the Schools offer Design Textiles or similar) and if you took a peek at any of her digital art you'd find hundreds of different clothing designs. 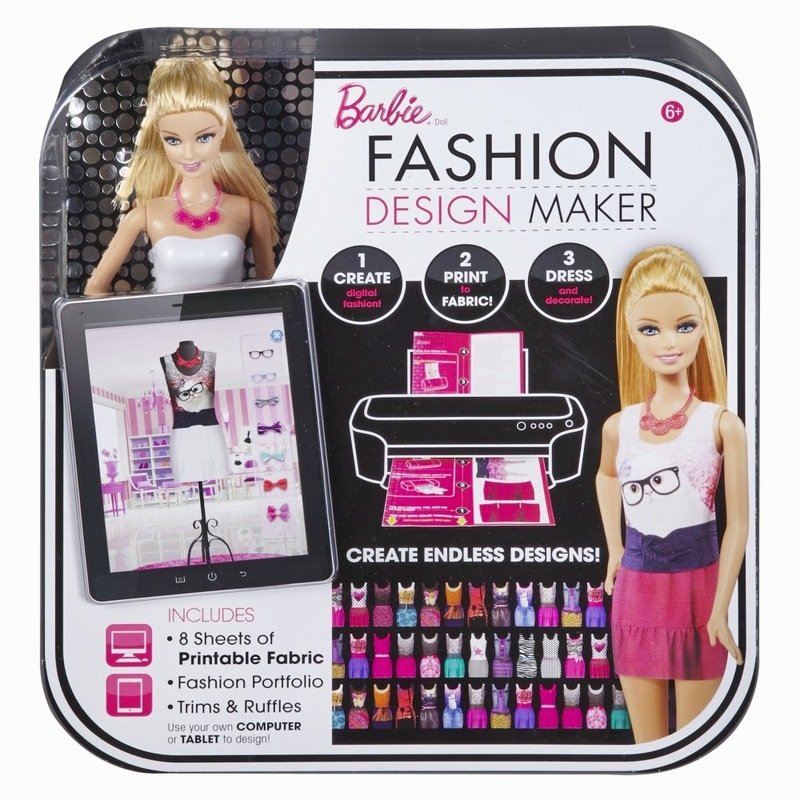 It wasn't that much of a shock therefore, when she suggested some items we might like to look into buying for her that the new Barbie Fashion Design Maker, aimed at girls aged 5+ ,was on the list. 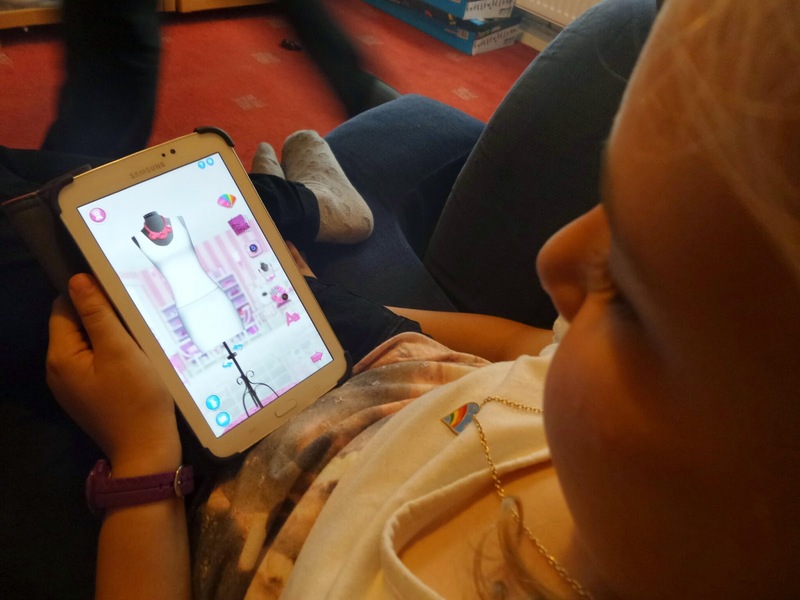 What was a shock for Top Ender, was when Mattel asked if we'd like to review the design maker and without Top Ender knowing I accepted the review and before we knew it the package arrived and Top Ender was busy downloading the app onto her tablet. I hadn't even realised there was an app to go with the doll. 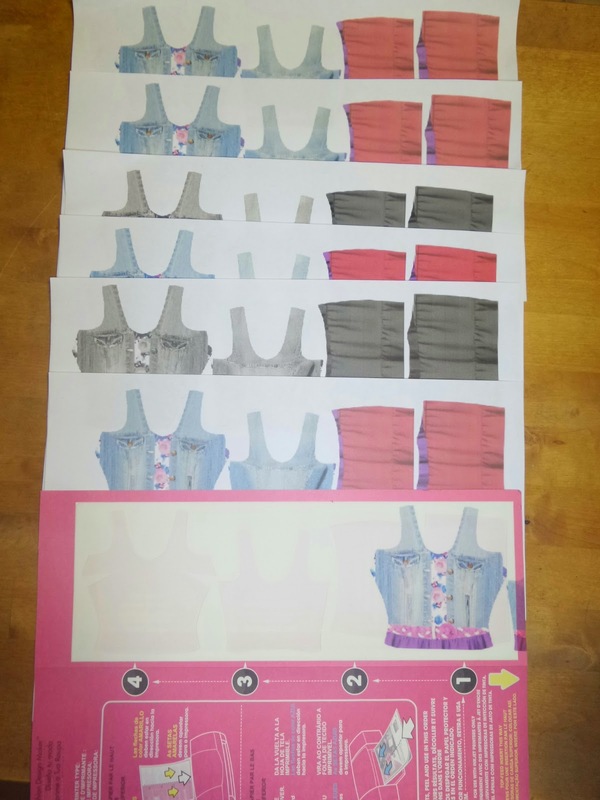 The app is really simple to use, you can pick through the various options to create different outfits for Barbie. You can add belts, photographs of you or pets or other things you've photographed and change colours and fabrics and basically it's a load of fun, and I may have borrowed Top Ender's tablet to have a play myself once or thirty times. Although she didn't allow me to save any of my creations as apparently they didn't meet her strict criteria of being fashionable. Or anything anyone would wear ever. The hard part was when it came to printing the clothes. Did I not mention that you print the clothes? Oh. 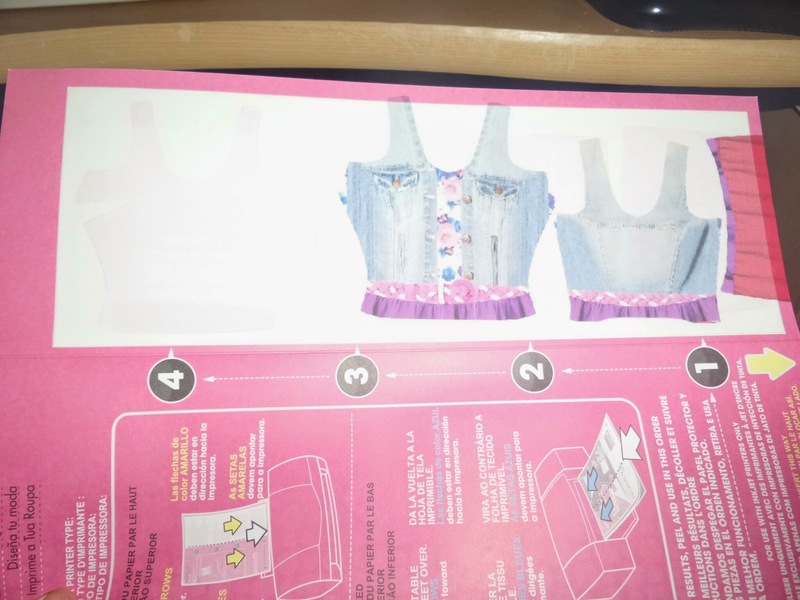 Well, what happens is after you've created the outfit, you print it on special paper and then peel the paper off and stick it to the Doll and you can stick it back to the paper if you want to give the doll a new outfit. The first problem was I couldn't work out how to print the outfit from the tablet app. Luckily Daddy worked out that all we had to do was save it as a PDF, send it to ourself so we can get it from our email and print it from the main PC. There is an update coming that will mean you can print from the tablet app, but for the mean time this is a work around. You could of course just use the website, but Top Ender really likes the app. The second problem was when Daddy went to print it. Daddy decided to print the PDF on a piece of ordinary paper first just to check that everything lined up. I claimed however that it was different paper and that would make a difference, so ignoring all sense I loaded the printer up with one of the fabric sheets. Which promptly got stuck in our printer and didn't print properly. I waited a couple of day before trying again, as I didn't want to disappoint Top Ender and ran into the same problem. Now, we have a front loading printer, so I thought it was possibly this that was causing the issue but the fabric sheets do say that they are possible to be used in these sorts of printers! We've now run out of the paper to print the designs on, and I'm sure that we'd be able to buy refill packs eventually, I just can't be searching for the right thing. Top Ender loves the app and the doll and I love the idea of the doll, I just wish it worked a little better for the RRP of £49.99. We were sent the doll to review. I like to think of myself as creative. I'm not sure why, because it is so far from the truth that everyone can see that I'm a total fraud, however it makes myself feel better to think of myself as being a creative sort. Then every so often I do something, Instagram it and get liked and inspire others and suddenly I am actually a creative sort. Well, I am for about five minutes and then Daddy goes and does something which is so loving and creative that I realise he's the true creative in our marriage. If I didn't love him so much, I'd probably be annoyed. It all started when we were in London and Big Boy decided to name his bottle of Ribena, Barry. Barry the bottle of Ribena, wasn't allowed to be thrown away, instead Barry the bottle of Ribena was hugged whilst we were on the underground, and stored in my handbag at all other times. 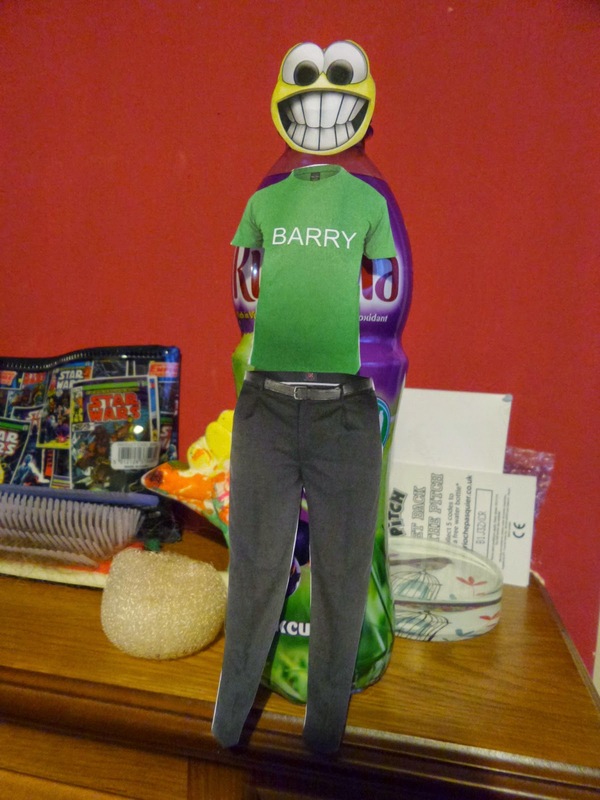 When we got home, Barry was placed on the Fireplace and the next morning when BB woke up, Daddy had made Barry look more like a Barry and less like a bottle of Ribena. 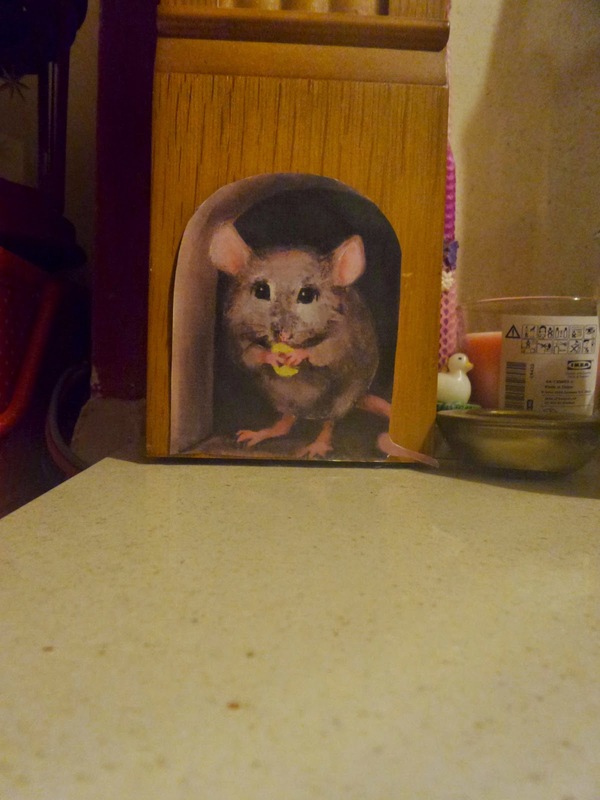 It was the start of Daddy's surprises for the children that he would create for them to find to know that he was thinking of them, even though he was away at work. This week, he left two surprises. There was one for me in the bathroom, which I found in the middle of the night, instead of in the morning like he was expecting. And one for the children, which he had to point out to me because despite staring at the Fireplace I missed it completely. And so now every week, the children and I look forward to are ready for some fun when Daddy leaves. I wonder what he'll do next!